Today on Groupon, $10 gets you $20 to spend at Old Navy! (valid in stores only) I’d be much obliged if you’d follow this link if you decide to purchase the deal, I get rewards if you do so. By the end of the week, look for a post here on my latest obsession – baking with buttermilk! I have been terrifically absent, I know. No perfect attendance award for me. Rest assured there will be some quality new reading material over the next week! I have lots I want to write about (my current obsessions: buttermilk, rhubarb and canning,) lots of ideas for personal reflection essays, and I realized I haven’t even inundated you with pictures of my cats yet. All coming soon lovelies, I promise! One thing I am focusing on doing more often this spring is cooking with what I have. I’m a pretty good bargain shopper (and experimenting with couponing to get even better! ), and I stock up on basics when I find them on sale. As such, I generally have a pretty good stash of things like pasta, rice, canned chickpeas, tomatoes, white beans, frozen veggies, etc. I read food blogs like it’s my job, and I come across so many delicious sounding recipes that I add to my “must try” pile. Sometimes I luck out and have all the ingredients on hand, sometimes I’ll run out to the store and pick up an item or two, and sometimes I try to adapt the recipe to what I have in my cupboard. That’s what happened last night. The Pioneer Woman posted a recipe for Risotto Primavera yesterday, and it got me to thinking. Risotto sounded soooooo good, but I didn’t have everything she called for – but I knew I had arborio rice, chicken stock, and various veggies, so I was good to go. I got some beautiful baby portabello mushrooms in yesterday’s CSA delivery, so those got chopped up and sauteed with a little olive oil and butter. I found a bag of Trader Joe’s mixed frozen veggies in the freezer – green beans, sweet corn, peas and carrots – we’re in business! After I had cooked up my veggies and mushrooms and removed them to a plate, I added a couple tablespoons of butter and olive oil to my pan, let the butter melt, then added my rice – a generous cup – to the pan and tossed it with the butter and oil for a minute or so. Then I added chicken stock (and a little beer) about a cup at a time to the rice and let it cook til all the liquid was absorbed before adding the next cup. I ended up using a little less than two cans of chicken stock and probably 3/4 cup beer. Taste test it as you go – you want the risotto to be smooth and creamy, but not mushy. When the last bit of liquid was almost absorbed, I added in about 3 oz of cream cheese and the veggies and mushrooms and stirred til the cheese was melted. Risotto is great because it’s so adaptable. When I was waiting tables, my favorite dish on the menu was a roasted duck breast with sweet pea risotto. You can customize it with whatever you have on hand, and it’s a great vegetarian main dish, or side dish for some protein. Viva le risotto! Pasta, bread and potatoes have long been some of my favorite foods. Carbs on top of carbs on top of carbs. And then I started getting into beer, GOOD beer, when I was working at a brewery/restaurant a few years ago. Beer = more carbs! 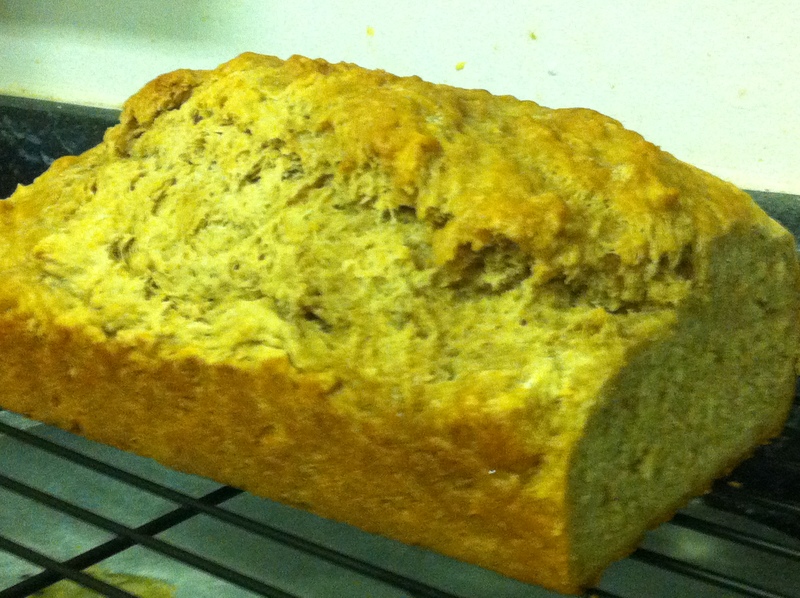 Imagine my delight when I discovered a way to add even more carbs to my carbs – beer bread! I’ve seen this recipe floating around the internet for awhile now, so I can’t attribute it to just one person. This is not my first attempt at this culinary deliciosity, but my first attempt was a fail for multiple reasons (that I’ll detail below) so I’d like to pretend this is the first. This is one of the simplest recipes I’ve ever made. In a medium bowl, stir together flour and sugar. Add the beer (slowly, so you don’t make a mess) and stir to combine. This is going to take some armwork – the last 1/2 cup or so of flour is going to seem like it doesn’t want to incorporate. Keep at it – I’ve found that taking my spatula and sort of smushing the flour into the batter works the best for me. When everything is mixed together, scoop into a greased 9×5 loaf pan and bake at 325° for 45 minutes. Pour the melted butter over the top and bake for another 15 minutes. Turn out immediately onto a cooling rack over a cookie sheet or wax paper (you’ll have some butter drippage. But hey, if you want melted butter all over your counters, who am I to stop you). *If you don’t have self-rising flour, you can make your own! For every cup of all-purpose flour, add 1 1/2 t baking powder and 1/2 t salt. Stir together before using. For this recipe, that would come out to 4 1/2 t (or 1.5 T) baking powder and 1 1/2 t (or 1/2 T) salt. Confused? 1 T = 3t. I went wrong in three, count ’em, three places in my first attempt. 1, either the recipe didn’t clarify or I didn’t notice that it was SELF-RISING FLOUR. Hence, my bread was dense and heavy. 2, I only had an 8×4 loaf pan. Wouldn’t have been as much of a problem if it hadn’t been for #3, the original recipe I used called for pouring the melted butter over the batter before it ever goes in the oven. When the bread rose as it baked, it pushed the melted butter out of the (too small) loaf pan and all over the bottom of my oven. And then the melted butter on the bottom of the oven started to burn. And fill my apartment with smoke. And set the smoke detector off at 10:30pm. I am really glad we only share one wall with a neighbor, and it’s not the wall the smoke detector is on. I’d make a lot of enemies. It’s not too much of a stretch to say there are a million ways to customize this bread. The taste varies greatly depending on the kind of beer you use – this batch was made with a home-brewed dunkelweizen, so I get a decent amount of banana and roasty flavors in this bread. I’d love to try this with a dark stout, as well as a light fruit and wheat beer. You could add cheese and herbs in different combinations – just remember to keep in mind how those flavors will work with the flavor profile of the beer you use. This is not a light, springy bread – it’s still a quickbread, so there’s no yeast. The baking powder is providing all of the rise when baking. I don’t think it would hold together well enough to make a sandwich out of (but just imagine all those NEW flavor combinations! ), but would work well as a side of bread to accompany a meal. If you experiment with different flavor profiles let me know how it turns out! I am so excited – I got the email this morning that my CSA deliveries start next week! I am having a great time imagining all the tasty salads I’ll make with the abundance of lettuce currently in season, and dreaming of all the pickles I’ll make, and the fresh tomatoes I’ll can… before reality sets in and I’m so sick of lettuce and cabbage and zucchini that I could puke. CSA stands for Community Support Agriculture. You buy a share (or half share, depending on your program or your needs) and every 1-2 weeks you get a box of fresh, organic produce and other products. The size and types of shares and the items in them vary widely from program to program, ranging from veggies, fruit, milk, eggs, cheeses, prepared/preserved foods, sometimes even flowers or medicinal herbs. My CSA share only includes produce, but they also have a buying club where I can buy things like milk and eggs (and even meat!) and have it delivered with my veggie share. Some CSAs will deliver right to your door, some will have once centralized location (like the farm where the food is grown) where everyone comes to pick up their food. Mine is a middle ground – there are pickup sites in various neighborhoods all over the city (and the tri-state area, for that matter) and you pick up your share from your designated site one day a week. Last year was my first year participating in a CSA. I’m not sure where I got the idea, but I think it might have been from a GRID Magazine article I read back in Feb or March 2010. I ended up buying a veggie half share from Lancaster Farm Fresh Cooperative and a fruit share, and splitting it with my roommate. There was a pickup site half a mile from our apartment, and I loved popping over there Mondays on my lunch hour to see what goodies were in the basket that week. We’ve signed up with LFFC again this year, but only for veggies this time. The fruit share was nice, but we didn’t feel like we got enough variety to justify the cost. I’ve started canning a bit this year (due in no small part to Food in Jars), so I’m really excited to see what recipes I can find to use up the abundance of some veggies we’ll end up with. I also love trying new veggies that I never would have heard of or tried otherwise. Last year I tried garlic scapes, rainbow chard, purple carrots, orange cauliflower, and lots more. Interested in joining a CSA? I’ve found the Local Harvest site to be chock full of good information. 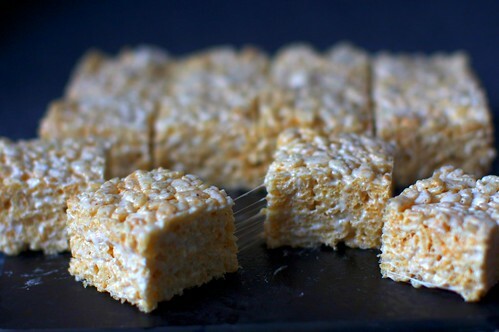 For as long as I can remember, rice krispy treats have been one of my favorite, well, treats. It’s the first recipe I ever memorized (never mind that it only has three ingredients)! I can still remember making them in my grandma’s kitchen, bittersweet memories since my grandmother passed early this year. Her memorial service is this weekend, and I can’t make it for various reasons, and it has me a little bummed out. I made the mistake of grocery shopping while hungry last night, and thanks to that special monthly cycle we women have the pleasure of dealing with, all I wanted was junk food. Specifically chocolate. I spied Cocoa Krispies on sale, but knew I didn’t need cereal at home, and besides I’ve been trying hard to eat healthier cereal or oatmeal in the morning. And then, it hit me. 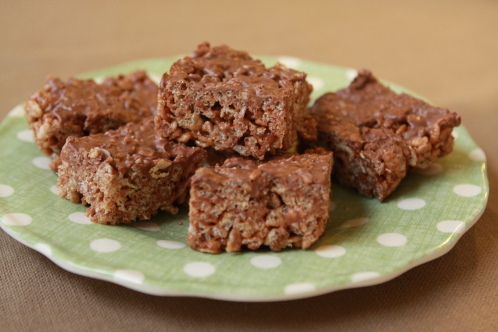 Why hadn’t I thought of this before – Cocoa Krispie Treats! It combined everything I was looking for – a bit of nostalgia, junk food, chocolate AND simple enough that I could start them at 10pm last night and have them done half an hour later. 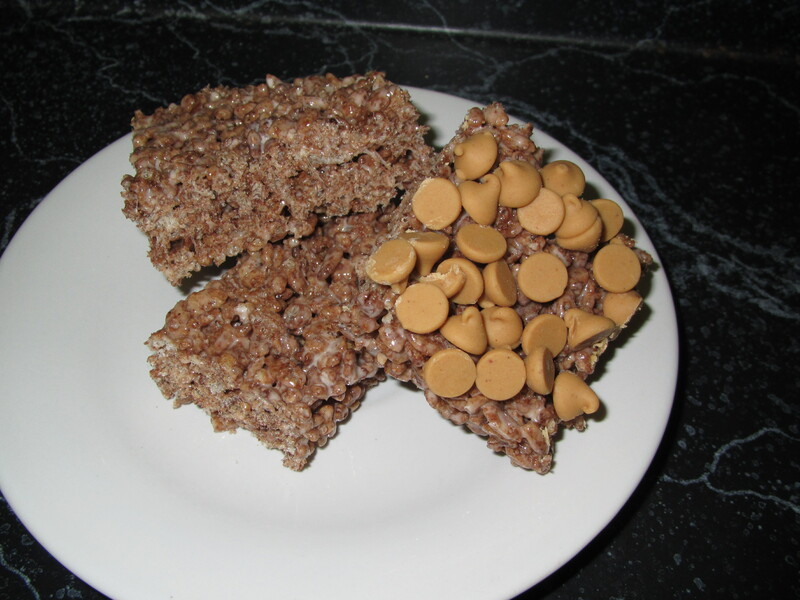 Cocoa Krispy Treats... with PEANUT BUTTER CHIPS! I had the tail end of a bag of peanut butter chips left, so those were scattered over one end of the pan while the mixture was still warm and pressed in a bit. It’s tasty, but I think I like them better plain. Melt the butter in a large pan (at least 4 quarts, and that’s on the small side) over medium-low heat. When the butter is mostly melted, add your marshmallows. Stir until marshmallows are melted and smooth, then turn off the heat and add rice krispies and stir til it’s all evenly coated. This is going to take a minute or two and give your arm a decent workout – really dig down to the bottom of the pan so you’re getting all the marshmallow in there. Spread in a buttered 13×9 pan, and press to even out with a butter spatula, buttered waxed paper, or a big fork dipped in water every 10 seconds or so. If you’re going to add chocolate chips or other toppings, now is the time to do it so they’ll stick. If using chips, sprinkle them on, let them sit for five minutes or so to soften a bit, then gently press them into the treats to make sure they adhere. I’ve always thought it would be fun to make these with other kinds of cereal, but I’ve never gotten around to it. I’m imagining Fruity Pebbles treats… Golden Grahams treats… maybe even Frosted Flakes treats! Here are some other krispy treats recipes that I think look exceptionally amazing. Joy the Baker dishes up decadent krispy treats topped with peanut butter fudge AND chocolate fudge! I adore Joy’s blog, and I’m so happy I found this in her archives. Just looking at the picture is enough to make my teeth ache! Love from the Oven has stuffed her rice krispie treats. I had no idea this was even possible. Consider my mind blown. Rice Krispy treats modeled after ice cream? Two of my favorite things in the world. I’m sold. Thanks to My Name is Snickerdoodle for putting these lovelies out there. 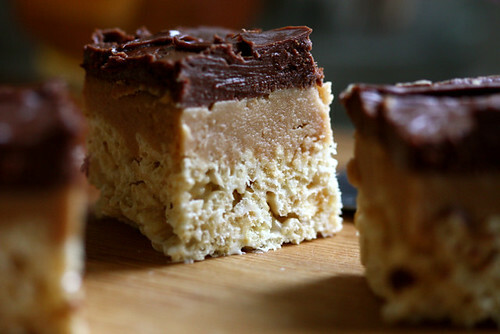 Keep It Simple Foods posted a vegetarian krispy treat with peanut butter and coconut. They might even be vegan – does anyone know if rice krispies are vegan? Looks super tasty and full of protein! Make it Do takes what I attempted with my chocolate krispy treats to the next level. Nine candy bars, people. Nine. No wonder her son loved making them, it’s a guaranteed sugar high! 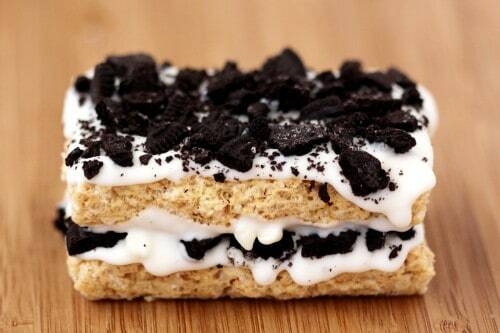 And another krispy treat recipe without marshmallows. Interesting. And of course, I had to include the Smitten Kitchen. I don’t think it’s possible to do a food blog recipe roundup without her. I want to rush home and start to work on at least half of the recipes she posts, and these salted brown butter krispy treats are no exception. She’s also the parent of one of the cutest children I’ve ever seen pictures of, and usually has a surprise photo of him tucked into each post. It makes my ovaries ache. Have a krispy treat recipe you love? Share it in the comments! Sabrina’s is one of my favorite brunch places in Philadelphia. 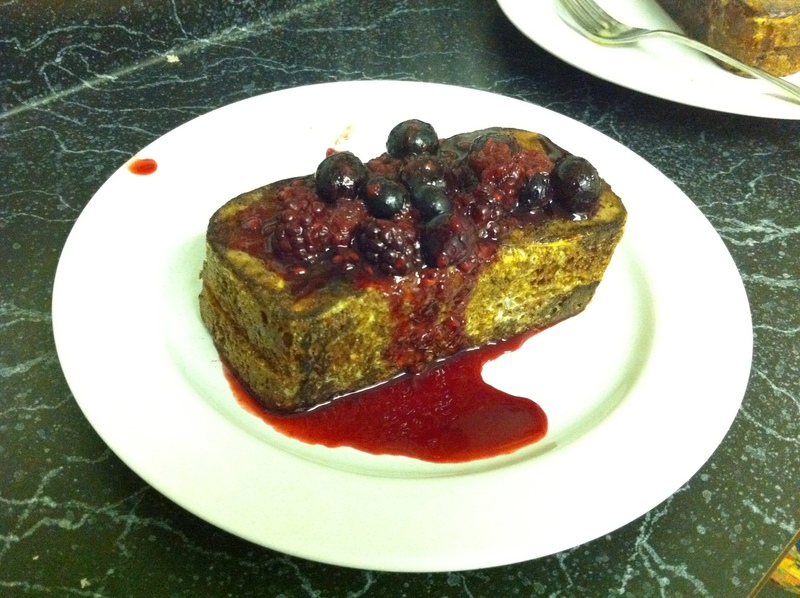 I always go with the best of intentions to try something new, and every time I end up ordering the stuffed french toast. There’s the standard stuffed, which is two thick slices of challah bread, cream cheese and banana filling, and banana topping, or there’s always a stuffed french toast on the daily specials. I’d go to Sabrina’s every weekend if I could, but I’d gain all sorts of weight and go broke doing it. 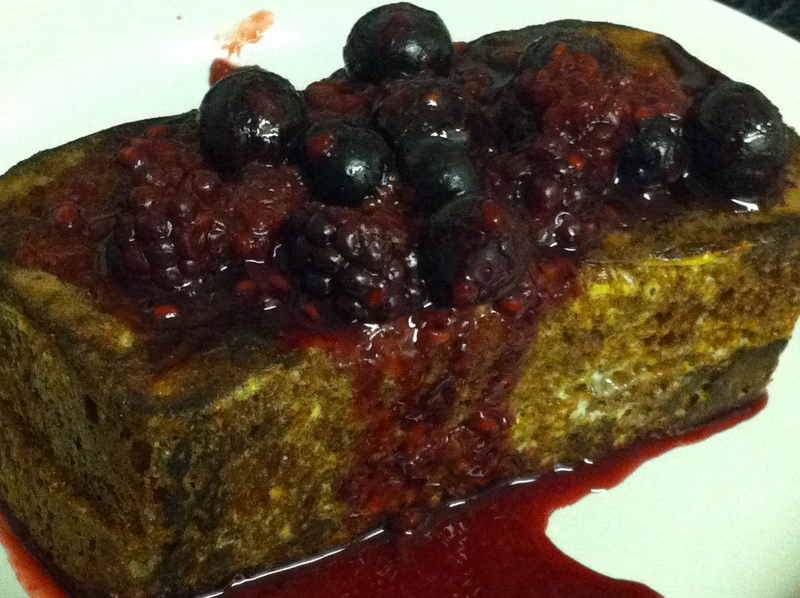 I decided to try my hand at stuffed french toast and see what happened! This is what happened! I used a homemade bread recipe from Smitten Kitchen, the homemade lemon curd I mentioned earlier, and some frozen berries. About the bread: I know it looks little. I didn’t get the rise out of it that was supposed to happen, but it tasted good anyway. I WILL be trying that recipe again. If you’ve made regular french toast, you can make stuffed french toast. First, start your berry compote topping. If you’re using fresh berries, it will take less time to cook down, but you’ll still want to start it first. If your berries are frozen, don’t bother thawing them beforehand. Toss them in a saucepan with a couple tablespoons of sugar. Turn the heat on medium-low and just let it cook down, giving it a stir every minute or two. 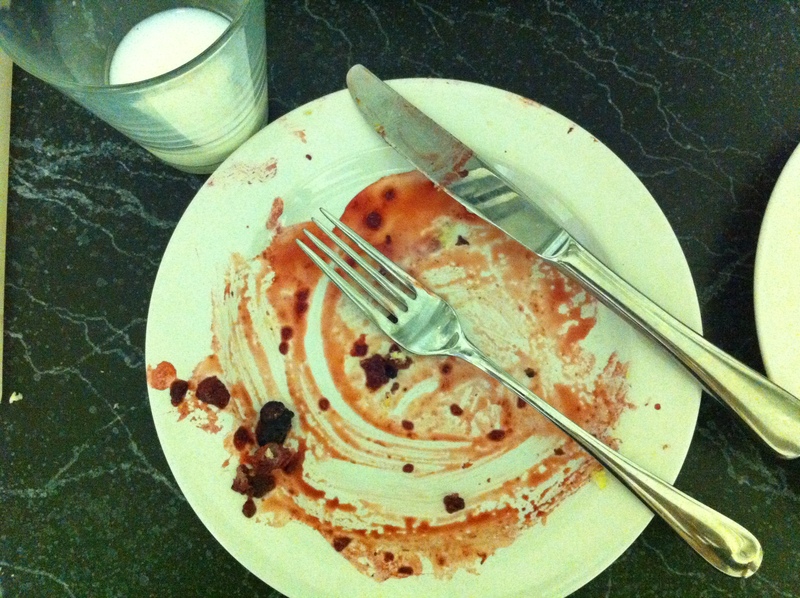 Don’t stir so vigorously that you break up all the berries, you want some nice chunks for on top of the french toast. Don’t let the sauce get above a simmer, or you’ll have purple berry juice everywhere. It’s not fun to clean up. The sauce will thicken a bit as it cooks. Now in a shallow dish, make your dipping batter. I use 3 eggs, a glug of milk, and a teaspoon or so of vanilla. I have never measured my batter, so I apologize that I can’t give better measurements. Whip your eggs together for a minute before adding the milk (or cream, if you’re feeling decadent) and vanilla, then whip a minute more. Grab a slice of bread, slather on the lemon curd and don’t be shy. I wish I had more lemon curd on mine, because the flavor really got lost. Next time, I may try whipping the lemon curd with a bit of cream cheese to make it go a little farther. Top with another slice of bread. Repeat with as many pieces of french toast as you want to make. Dip each sandwich into your batter. You want to give it enough time to let the batter soak into the bread just a little bit, but not so much that it gets soggy. I wish I had better advice to offer, but it’s really trial and error. I’d say a good five seconds on each side. Swish it around a little bit. Cook over medium to medium high heat until each side is golden brown. To keep it warm as you’re cooking the rest, turn your oven to the lowest setting (mine is 200°F) and place on a heatproof plate or dish inside. To serve, cut on the diagonal if you’re feeling fancy, and spoon a couple good scoops of berry compote over the top. Add powdered sugar or whipped cream if you’re feeling super fancy! I wasn’t.